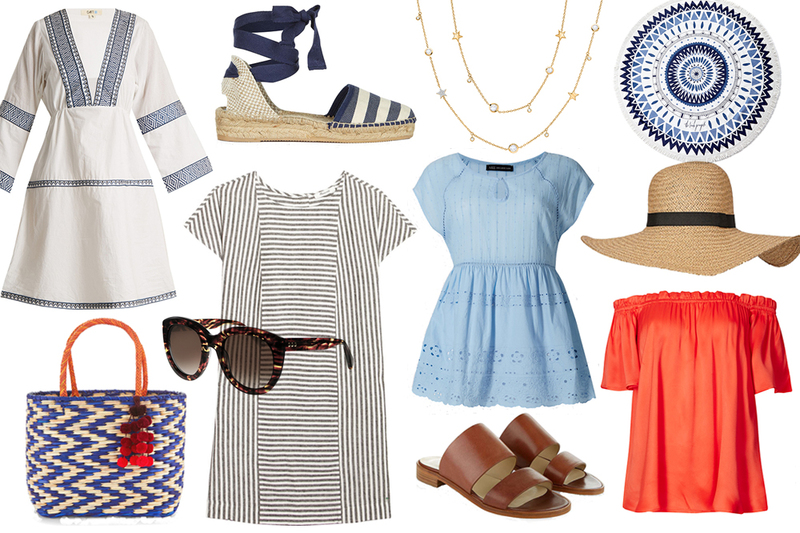 9 MUST-HAVE SUMMER WARDROBE ESSENTIALS. I'm feeling really inspired about holiday clothing at the moment. And I've found that, whilst mentally packing, I very easily gravitate towards certain styles and colours, or items that I consider my must-have, travel essentials, so I thought I'd share them with you today, hope you enjoy! Whilst it creases like lord knows, there's nothing like linen in the summer to keep you cool. I must say I love the shift-shape, throw on kind that take no effort at all, but a more structured, A-line number is equally up my street - Monsoon even have a lovely, striped cropped jumpsuit that's really reasonably priced and looked so fab on the lady wearing it in store. A big straw hat is a must for me, pretty much solely to keep the sun out of my face. Tie a ribbon or scarf around it, with loose ends, for a more feminine touch. I've always been a black sunglasses kind of person, but I've made the switch! I suppose black glasses went with my entirely black wardrobe, and tortoiseshell ones now better complement my blue and white summer attire. I love these oversized, dark tortoiseshell ones. Holidays definitely call for a pop of summery colour, don't you think? A nice, mellow yellow, or raspberry pink, or in my case, a hot, orange-y coral. I love this off the shoulder bardot from M&S. Broderie is the perfect way to jazz up a plain white blouse or top, and great if you want some sort of pattern without a blend of colours. GAP have a great range of white broderie tops and dresses - such a staple for summer, and I love these super flattering tops in blue and white. It doesn't matter the season, there'll be stripes in my wardrobe. Whereas in autumn and winter it'll be a thick breton, for summer it's thin striped shirts or a figure-flattering peplum. I should find out how many tan pair of shoes I own. I'll tell you from the off that it's many! They're throughly versatile and work with any outfit you could possibly wish to wear. I love these simple sliders and these Hollister flats are so comfortable, for long city walks - I recently featured them on my Instagram feed. Other than the obligatory tan shoe, I love an espadrille when the weather warms up - there's no shoe that quite sings 'holidayyyy' like these do. I love to wrap a light scarf around my shoulders when the temperature drops in the evening from scorchingly hot to pleasantly balmy. It's a lovely way to introduce a little colour or embellishment too to an otherwise simplistic outfit - the perfect accessory for capsule wardrobing. Let me know, what are your holiday style essentials? Love these sunnies! I can never have enough! So many lovely pieces, I really want to get myself a pair of espadrilles for the summer!